Compton’s Garage in Cubbington is set to undergo a major revamp which will include a takeaway chain and a convenience store open at the site. The garage in Rugby Road, which currently includes a Shell petrol station and MOT test centre, has been open in the village for about 70 years and was last owned by villager Neville Compton who had inherited it from his father. Comptons Garage, Rugby Road, Cubbington, is undergoing a major refurbishment and rebuild, which will involve a new Spar convenience store, Subway sandwich takeaway as well as an improved forecourt and a new MOT test centre. Current owner Brian Tuw bought the business from Mr Compton about ten years ago and has been planning to bring the site more up-to-date since then. He has now received planning permission to add a Subway sandwich takeaway to the site, a Spar mini market with a specialist frozen meals section and to increase the size of the station forecourt to make it quicker and easier for motorists to buy petrol. The MOT test centre will also be updated and improved to cater for most classes of vehicle. 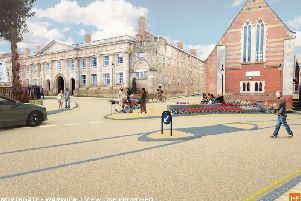 Mr Tuw said: “Everyone in the community has been highly supportive of the plans - in fact the only person who was against it was the planning officer but permission was granted by a vote of eight to one. Mr Tuw, 74, who is from Gloucestershire, first set his sights on buying and improving the garage when he used it after visiting the Royal Show at Stoneleigh Park about 15 years ago. His company, Simon Smith Retail Ltd, for which his wife Vicky and daughters Susie and Julie also have important roles, runs several petrol stations around the UK and is highly regarded by Forecourt Trader Magazine having won its Trader of the Year award in 2005 for its former Barnwood Budgens site in Gloucester and also being listed among its top 50 independent companies. At present Compton’s petrol prices, as set by Shell, tend to be more expensive than urban sites. But Mr Tuw said he was hoping to bring these prices more in line with supermarkets and other petrol stations in Leamington and other nearby towns. He said: “We’ll certainly be trying to do that. The big problem is, oil companies control the price and we don’t have very big margins to play with. Selling larger volumes allows us to cut the price of fuel but it is a difficult equation. “If we are to buy the product at £1 a litre we are lucky to get 2p or 3p back from that after we endure the losses when the petrol evaporates. Compton’s will close this week when its current stock of fuel runs out and is due to reopen when the work is completed around Christmas time. It will be open on seven days a week from 6am to 10.30pm. Peter Delow, chairman of Cubbington Parish Council, said that while the work and closure would inconvenience residents and customers in the short term, the general feeling was that the improvements to Compton’s would prove to be an “asset” to the village.